Surrendering his life unto the lotus feet of his spiritual master, Sri Uddharana , who had hailed from a very opulent gold mercantile family,subsequently renounced his wealth, fame ,prestige and accepted the robes of a mendicant to further the cause of Krishna consciousness.Being Nityananda Prabhu’s personal cook, Sri Uddharana received the rare fortune of accompanying the Lord wherever He travelled. Srila Prabhupada (refer –‘The birthplace of A.C Bhaktivedanta Swami Prabhupada, Tollygunge’) traces back his own family lineage to this gold mercantile community in Saptagram. He mentions how the Britishers had established Calcutta, taking the financial help and assistance of these suvarna baniks (Gold merchants).These businessmen had later come down from their ancestral homes in Adisaptagram, to set up their businesses here in Calcutta. The Bengalis with the title De ,Sil or Mullick actually belong to this same family lineage and hence share the same gotra (Srila Prabhupada’s earlier name was ‘Abhaya Carana De’). The title ‘Mullick’ was later awarded by the Muslim rulers,to those in this mercantile community who intimately associated and conducted business with them.But despite the different surnames, all these family members share a common ancestral root (refer – ‘The pious Mullicks of Bengal’). Sri Divakara datta,as Sri Uddharana was previously called before he had received his initiation, was the son of Srikara Datta, the renowned gold merchant of saptagram. His mother was Srimati Bhadravati Devi.Saptagram, as the name suggests, comprised of the following seven villages – Saptagram,bamsabati ,shibpur, vasudevapura, krishnapura , Nityanandapur and Sankhya Nagara. Saptagram finds its mention even in the vedic scriptures as the sacred place where in the previous yugas the seven celestial sages had performed severe austerities in order to please the supreme Lord. Hence Saptagram has traditionally been an exalted site for pilgrimage. The three sacred rivers Ganga, Yamuna and Saraswati meet here at saptagram and their confluence is renowned as ‘Triveni’.The ‘Triveni Ghat’ (‘ghat’ means bank) is visible even today, and is said to have been later reconstructed by King Mukunda Deva of Orissa.The land of Saptagram has been eternally blessed by the ecstatic awe inspiring pastimes of Nityananda Prabhu and His beloved disciple Sri Uddharana datta Thakura.Saptagram is also renowned as the birthplace of Srila Raghunatha Das Goswami, the son of the erstwhile rich landlord ,Sri Govardhan Majumdar. Srila Raghunatha Das, on obtaining the mercy of Lord Nitai, went onto become one of the greatest renunciates of our Gaudiya sampradaya and one of the foremost Goswamis of Vrindavana. 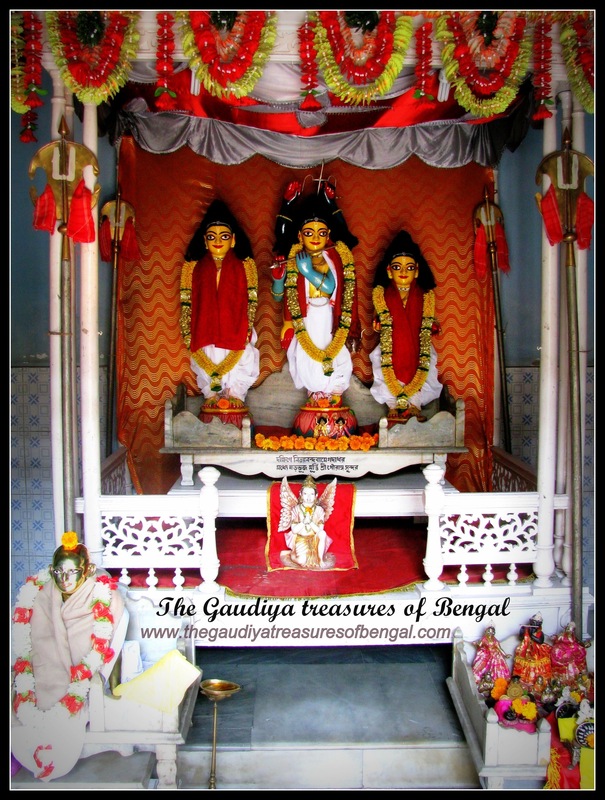 ‘The Gaudiya Treasures of Bengal’ has covered the life and pastimes of Raghunatha Das in a separate article entitled – ‘Srila Raghunatha Das Goswami Sripat, Krishnapur Thakurbari (Near Bandel)’. 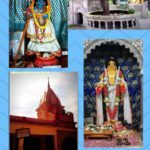 Not very far from here, is also the Sripat (residence) of another stalwart Vaishnava named Sri Jharu Thakura, who was a sweeper by profession.We have covered his pastimes in a separate article entitled – ‘Sri Jharu Thakura Sripat, near Bandel’. Saptagram had a deep port in those days and several ships used to commute upon the Saraswati river, on whose banks the town had once flourished. The mercantile community used to conduct their businesses using these waterways which also had an outlet to the sea. The famous businessman of Bengal , ‘Chand Saudagar’ ,is also said to have used these routes for his trading. Overall Saptagram was once a buzzing prosperous town, where the traders had come in and established their settlements from various parts of the world.Not far from Saptagram is the town of Bandel ,where a very famous Portuguese church ,popularly known as the ‘Bandel church ,stands tall even today. This is one of the oldest churches to have been established in India (around the 16th century). However at present, the glorious days of Saptagram are only a distant memory.The river saraswati currently stays dry for most part of the year. With the water avenues getting blocked, the trades could no longer flourish and Saptagram gradually lost its importance as an industrial township. Uddharana Datta Kripa kori ganashane Ailen datta Uddhrana bhavane Saptagram basi shuni prabhura gamana Chaturdik dhaya lok karite darsana Uddharana adi grihe bare mahananda Saba nritya kirtane bihavala Nityananda.. Translation – Sri Nityananda prabhu arrived at saptagram at the house of Sri Uddharana datta in order to shower special mercy upon him and to reveal to everyone Sri Uddharana’s true identity.Hearing the news of Lord Nitai’s arrival, the local residents rushed to take His darsana.. As a result the house of Sri Uddharana thakura became inundated with devotees, and all of them wanted to catch a glimpse of Lord Nitai who sang and danced in ecstasy. Sri Vasu Ghosh here describes, how the amazing pastimes of Vaikuntha were being manifested at the house of Sri Uddharana datta Thakura. 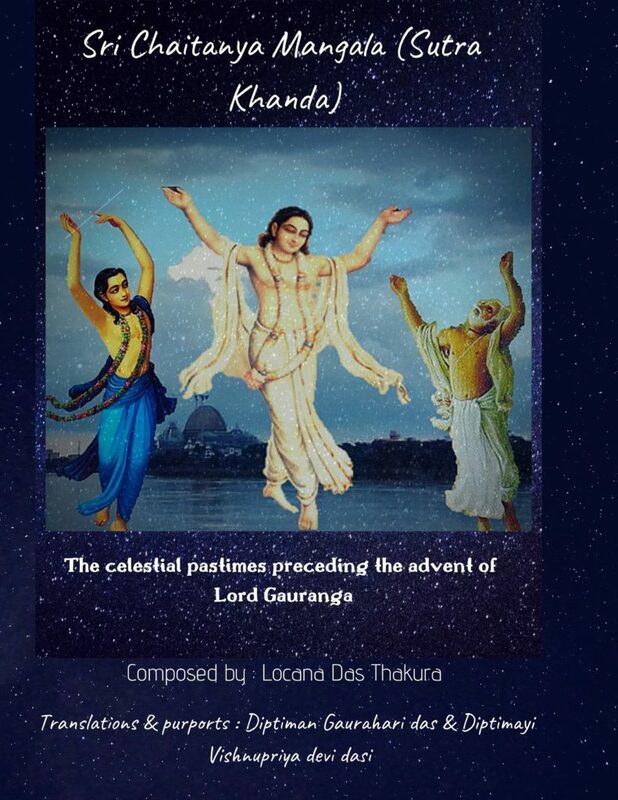 One who sings glories of Sri Uddharana Datta is a fit candidate to receive the merciful glance of Lord Nityananda. Sri Uddharana Datta’s love and devotion for the lord is akin to that of Sri Prahlada and Dhruva Maharaja. 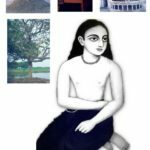 ‘The Gaudiya Treasures of Bengal’ has covered the pastimes of Sri Vasudeva Ghosh in a separate article entitled – ‘Narpota,The Sripat of Sri Vasudeva Ghosh , Tamluk’. Sri Uddharana was Lord Nityananda’s personal cook and by accepting the prasadam cooked by him, who belonged to a so-called low caste, Nitai demonstrated to the entire world, that Krishna consciousness is not dependant upon the petty considerations of one’s caste and creed.The only factors that determine one’s stature in spiritual life, is the love and dedication one possesses towards Sri Guru and Gauranga. Sri Uddharana Datta Thakura was a stalwart Maha Bhagavata vaishnava by such considerations. 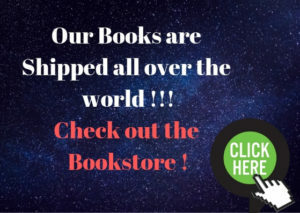 ‘The Gaudiya Treasures of Bengal’ has covered the pastimes of Sri Uddharana Datta Thakura in Barddhaman, where he had widely preached later on, in a separate article entitled – ‘Sri Uddharana Pura ,Barddhaman (Near Katwa)’. As evident from the title, the entire place has been named after this stalwart Vaishnava. Sri Uddharana datta had a very big heart.He was not only very rich, but also extremely merciful. 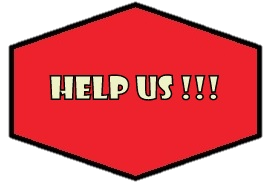 Once there was a devastating famine in Saptagram and the people were dying of disease and malnutrition. Sri Uddharana Datta, feeling compassionate, had then organised a massive relief program. He had set up a camp on 10 acres of land, and constructed huge warehouses storing rice, lentils,vegetables ,etc. The food was then utilized to feed the poor and needy. The eastern railway station of ‘Adi-Saptagram’ presently stands on this very piece of land which had previously been utilised for the relief purposes by Sri Uddharana.Being rich and influential, he had also arranged for construction of residential buildings by clearing away the jungles, so that the homeless could find shelter. Sri Uddharana was a gem of all virtues. Lord Nityananda spent His days at saptagram singing and dancing in ecstasy. The entire village of saptagram had gathered at Sri Uddaharana’s house to catch a glimpse of merciful Nitai. Translation -Sastibar, a melodious singer who was a favorite of Lord Nitai ,sang while Sri Uddharana Datta Thakura danced. Who else could possess more love and devotion towards Lord Nityananda? The waves of Harinama washed one and all. Irrespective of one’s caste, qualification or status, people were getting delivered.Lord Nitai freely distributed the treasure of Krishna Prema, that eluded even the great demigods like Brahma and Shiva. But there was one brahmana, who had not yet received the mercy. 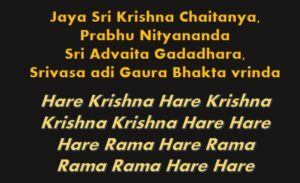 Being envious he could not tolerate the widespread chanting of the Lord’s holy names.Hence with an intention to insult Nityananda prabhu, he arrived at the residence of Uddharana Datta one day. There he started off a debate on whether the path of Jnana (dry speculation) or Bhakti (devotional service) was superior. Sri Nityananda didn’t want to defeat the brahmana very quickly and hence prolonged the discussion. Soon it was time for lunch and Nityananda Prabhu invited the brahmana to accept his lunch with them.The brahmana obliged and after taking his bath, he sat down to honour the prasadam. Before accepting the prasada, the brahmana enquired about the cook. When he heard that Sri Uddharana Datta had prepared the meal, he got very angry and wanted to leave immediately. He argued that a brahmana cannot be accepting food that was cooked by a low caste Suvarna banik. Lord Nitai cited him several references from the revealed scriptures .He tried to explain that the remnants of Sri Krishna, is always pure and is completely spiritual, and should be always accepted irrespective of whoever had cooked it. Besides, caste and creed is something based on one’s qualities and not upon birth. Nitai concluded by saying that prasadam cooked by a great vaishnava like Uddharana Datta, was fit to be accepted by all.The brahmana being thus pacified ,sat down again. The brahmana was enraged once more seeing Sri Uddharana personally serve the prasada. He could not accept that he would have to eat food that was contaminated by a low caste. He got up from his seat once more. This time he could not be pacified.Nityananda prabhu then asked Sri Uddharana to hand Him over his cooking stick. Nitai, took the stick and planted it onto the ground. By His mystical potency, in front of everyone’s eyes, a beautiful fragrant Madhavi tree immediately manifested from that stick. 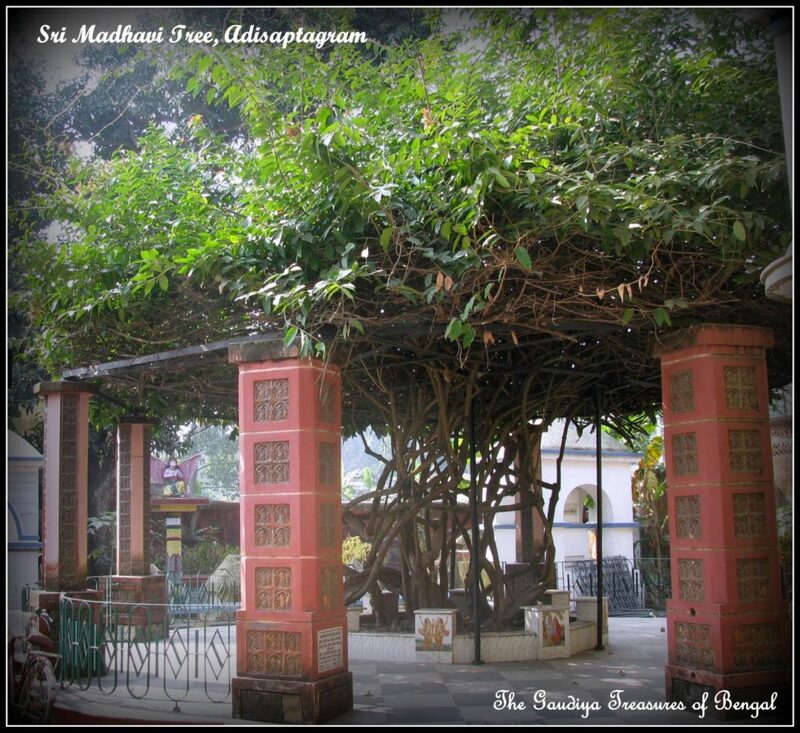 The Madhavi tree still stands today sheltering the samadhi of Sri Uddharana Datta at his house in Saptagram. The tree as if bends down and showers it’s beautiful madhavi flowers as an offering to our great Vaishnava saint. 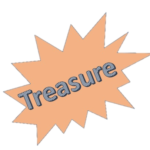 Seeing the miracle right before their eyes, all present were stunned.The Brahmana was shocked and kept staring at the tree for some time. Coming back to his senses, he offered his respectful obeisances unto the Madhavi Tree.Crying and chanting ‘Haribol ! Haribol’ he started rolling onto the ground in ecstasy and smeared the sacred dust all over his body. Getting up he begged forgiveness from Sri Uddharana and Lord Nitai. He requested Sri Uddharana to kindly bless him by serving him the prasadam. The Prasadam, he said, will not only satisfy the hunger of his stomach but also the thirst for pure love of God that had eluded him.Thus by the causeless mercy of Lord Nitai and Uddharana Datta, the envious brahmana was delivered. We worship the lotus feet of our spiritual master ,whose causeless mercy has empowered us ineligible fools ,to gain entrance and take up service in this exalted abode of Adisaptagram. We seek shelter of this holy land, and pray that its glories remain forever imprinted in our heart.‘The Gaudiya Treasures of Bengal’ offers millions of obeisances and humbly prays to Sri Nityananda prabhu and Sri Uddharana datta thakura that we advance in our Krishna consciousness, develop attachment unto their lotus feet and are able to serve Sri Guru & Vaishnavas, by our honest and sincere efforts. We seek their blessings and compassion , in successfully rendering this humble service of reciting the pastimes and revealing the pastime places of the Supreme Lord and His beloved associates.We shall consider ourselves greatly fortunate and our existence meaningful if Lord Gaurahari and our dear spiritual master are kindly pleased with our endeavours. One who takes darsana of the holy land of Saptagram, is relieved of all kinds material miseries. Lord Nityananda eternally performs His blissful pastimes over here. Here at Thakurbari, we can take darsana of the sadbhuja (six armed) Caitanya Mahaprabhu deity which was personally worshipped by Sri Uddharana Datta Thakura. The deity is accompanied on the right by a deity of Sri Nityananda prabhu and on the left by Sri Gadadhara Pandita.A beautiful deity of Sri Uddharana datta is also worshipped here. The temple compound at Adisaptagram houses the Pushpa samadhi tomb of Sri Uddharana Datta Thakura which rests under the cooling shades of the sacred Madhavi tree. The full body samadhi of Sri Uddharana Datta is situated at a different place called Sri Uddharana Pura. We have covered the relevant pastimes of this place in a separate article entitled – ‘Sri Uddharana Pura ,Barddhaman (Near Katwa)’. 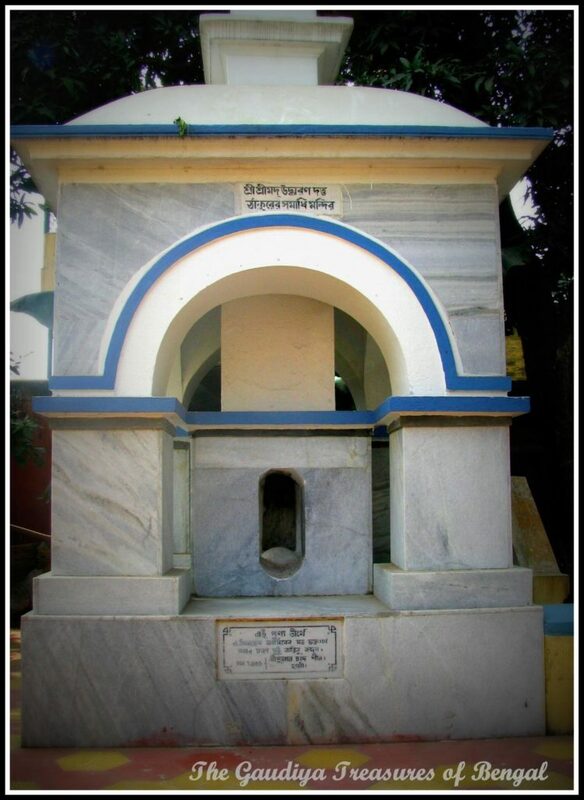 Another of his pushpa samadhis is located at the bhajana kutira of Madhu Pramanick, the barber who had shaved the hairs of Mahaprabhu during His sannyasa (Please refer – ‘Sakhi Akhra and Madhai Tala ,Katwa’). Just outside the temple compounds is a beautiful serene pond, where Sri Nityananda Prabhu once lost one of His anklets while bathing. 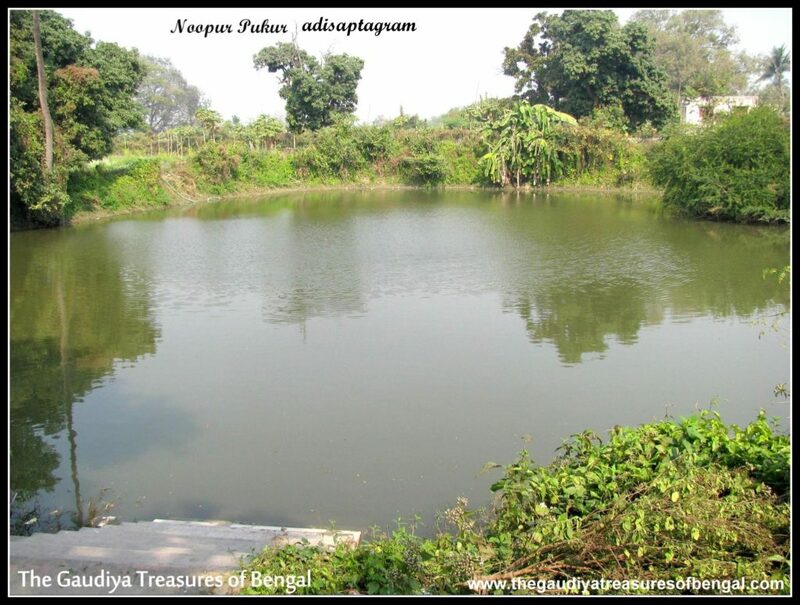 Since then, this pond is known as ‘Noopur Pukur’. Noopur means anklet and pukur means pond in bengali. The pond is said to bestow pure love of God upon anyone who bathes or comes in contact with its sacred water. 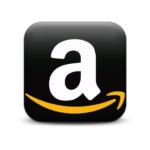 We can take a train from howrah and get down at the AdiSaptagram Railway Station. 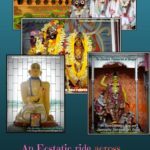 From there we can take an auto/rickshaw to reach Sri Uddharana Datta Sripat, which is also locally known as Adisaptagram Thakurbari.We ,from ‘The Gaudiya Treasures of Bengal’ ,however reached here driving all the way from kolkata. One can take the GT Road and drive straight to reach Adisaptagram. It is hardly a 2.5 hours drive from kolkata. 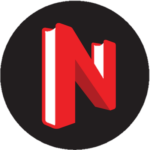 Accommodation – One can choose to stay in any of the prominent hotels near Bandel like hotel aquatic palace (on Kalyani expressway), etc. Sri Uddharana Datta Thakura’s Sripat is hardly a 30 minutes ride from there. The devotees need to contact the temple to avail their prasadam.